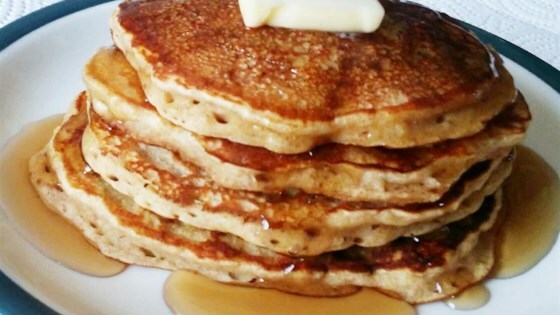 "These delicious banana-buttermilk pancakes use whole wheat flour combined with soy flour to make them light and fluffy. Try adding cocoa powder or cinnamon and nutmeg for more flavor." Combine whole wheat flour, all-purpose flour, soy flour, brown sugar, baking powder, baking soda, and salt in a large mixing bowl. Whisk buttermilk and egg whites into the flour mixture until no clumps remain in the resulting batter; add mashed bananas and mix well. Place a large non-stick skillet over medium heat. Add 1/4 teaspoon oil to the hot skillet; tilt skillet to coat cooking surface in oil. Ladle about 1/4 cup batter into the skillet. Cook until tiny air bubbles form on top, 2 to 5 minutes; turn and continue cooking until the bottom is browned, 2 to 3 minutes. Repeat with remaining oil and batter. Keep finished pancakes warm. I had no soy flour so just increased white flour. Turned out great.